Burning Moon's Inside advice: Balmshot Giveaway & Review! The Arizona sun and heat during the summer can do quite a number on your skin especially the delicate skin on your face and lips. Not only is it important to wear sunblock to protect your skin but carrying lip balm is also a great way to protect your lips not just from the sun but from the wind and dryness in general. Until recently I had never heard of the company Balmshot but I am glad I came across them because I am really enjoying their lip balm. Balmshot was created after the owner Wayne S. Forrey learned he had lip cancer due to his outdoor lifestyle and frequent sunburned lips. After he went through his lip construction surgery which was a success he wanted to help keep his lips moisturized and protected but he wasn't very happy with the lip balm selection that was out there because the caps and twist base would move in his pocket causing the lip balm to get smashed up in the cap. He set out to design a lip balm container that was functional which is when Balmshot was created. They currently sell six products in total two of which are the same scent but they offer different packaging. I received a zippered ditty bag for review along with one of each of their products, which includes the Classic lip balm, Pure Pink lip balm which is vanilla mint scented and Pink camo which is the same scent but it has a camo product packaging vs all pink, a Cool mint lip balm, a organic pomegranate lip balm and their Mintyshot breath spray. The lip balm I decided to claim as my own is the pure pink the vanilla mint intrigued me and I love it, it has actually replaced the mint balm I had been using prior. One of the first things I noticed aside from the trendy packaging is that the balm itself is a little wider than regular lip balm tubes so you are able to get your entire lip in one swoop instead of having to go back a second time to make sure your whole bottom lip is covered. The formula they use is silky smooth and smells fantastic even my four year old commented on how much he liked the smell. The tube itself is fantastic it looks just like a 20g shotgun shell. The cap fits securely onto the tube and it won't pop open in your pocket or purse, even though it is ribbed it doesn't catch on anything which is nice and makes it to where you actually have to hold onto it firmly to pop the cap off. The metal twist base is also nice, it is smooth and stays in place until you are ready to twist your lip balm up further. The formula has SPF 15 which helps protect your lips from windburn and sunburn, the way they created the formula leaves your lips feeling smooth and moisturized without giving you a greasy or slimy feeling. Proceeds from the sale of every Pure Pink and Pink Camo BALMSHOT product are donated quarterly to the Mountain States Tumor Institute to help uninsured women pay for mammograms and breast cancer screenings. One lucky ready is going to win a Six pack of Balmshot products and a zippered ditty bag just like I received. This is open to US & Canadian Residents! Please remember if you DO NOT leave a comment on this blog post as your mandatory entry into the giveaway then all of your entries will be void. Doing the Daily entries will increase your chance of winning. Winners have 72 hours to respond to the notification email! Giveaway entry question: Please stop by their website and let me know either something you learned about the company or let me know which scent/flavor lip balm you'd like to try. I would like to try the organic pomegranate. I like that they donate money to fight breast cancer. I saw this and thought that it was really great. I like that they are helping uninsured women get mammograms. Proceeds from the sale of every Pure Pink and Pink Camo BALMSHOT product are donated quarterly to the Mountain States Tumor Institute to help uninsured women pay for mammograms and breast cancer screenings. I'd like to try the Cool Mint. 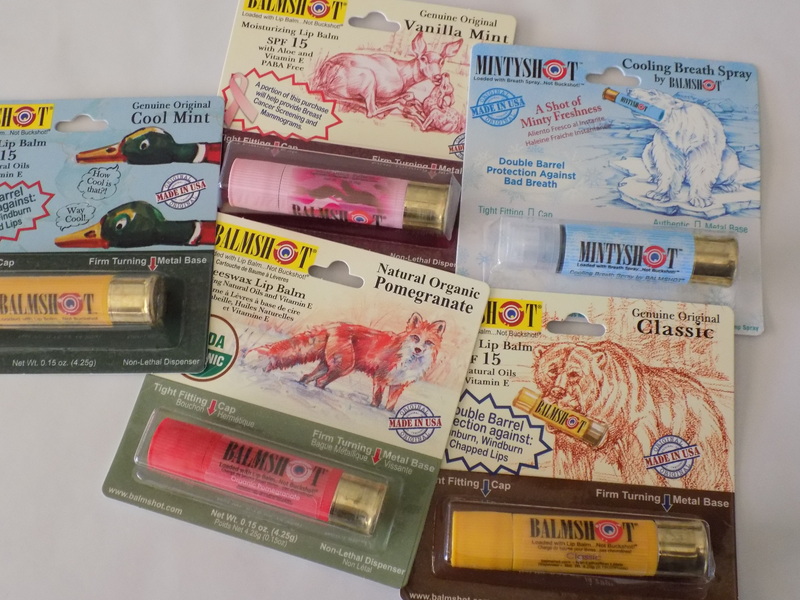 I learned that the founder of Balmshot is from Idaho and he invented this in his garage after getting lip cancer. Not liking the gooey messey chapsticks he came up with Balmshot. I'd love to try this! I would like to try the vanilla mint. When I don't have on lipstick I do have on lip balm. I would love to try this brand and love that it doesn't twist up or down while in your pocket. I think it is wonderful that Balmshot donates its sales from every Pure Pink and Pink Camo BALMSHOT products for breast cancer. Any company that donates any part of their proceeds to cancer research is a good thing! Pomegranate sounds great! I would love to try the cool mint also learned the company donates to cancer research. I'd like to try their organic pomegranate lip balm! I think my favorite scent/flavor would be the Organic Pomegranate lip balm. I would try the pomegranate lip balm. You can never go wrong with that one. I would like to try the Cool Mint flavor. I like to try most of them.. Although Pomegranate sounds interesting. I want to try Pomegranate. I would enjoy trying the Vanilla Mint the best. Wayne S. Forrey invented a much better lip balm dispenser system including a firmer twist base and tighter fitting cap. Id love to try the vanilla mint! I would love to try the Vanilla Mint lip balm. I would love to try the vanilla mint! I would like to try the vanilla mint. I love how these look. Vanilla mint would be my top pick.